Rod Smith would love to get the chance to gain some revenge for his pal Adam Etches. 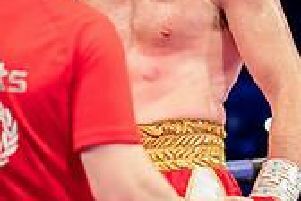 Etches lost his unbeaten record to Sergey Khomitsky in March and, like Smith, returns to the ring on Saturday, both against Argentinian opposition. Etches and Smith have sparred each other in preparation for the show at Sheffield’s Double Tree by Hilton. Dronfield’s Smith says: “ We’ve had some good rounds, both come-forward, a bit of boxing from me. We don’t give a lot away about sparring, but it was a good six round tear-up. I’ve been looking at him (Khomitsky) and looking at Adam’s fight against him, a few times. Smith is pacing himself after just one fight since 2013. “I am taking one fight at a time obviously I’d like to work myself up to the British title, get my Lonsdale belt. Smith says he wouldn’t rule out a future match with fellow Dronfield middleweight Lewis Taylor. “Me and Lewis are mates, he is like me he doesn’t back out of a fight. Meanwhile, negotiations between Kell Brook and Brandon Rios’s camps appear to be stalling. Sheffield’s IBF world champion is shifting his emphasis to a fight with American Keith Thurman. He has asked promoter Eddie Hearn to have him put a unification fight with the WBA ruler. Brook is pencilled in for action in Sheffield, probably the Arena, on October 24.